They typically meet or exceed all standards, but are not certified. If you want to certify them, you need to submit them to the appropriate authority yourself. SMALL IN SIZE, BIG IN PERFORMANCE AND FEATURES, AND A TRUE EYE-CATCHER! This unit is a real eye-candy. With 2x5 LED VU meter and backlit LCD display wrapped up in a tiny and stylish black anodized enclosure this unit really draws attention. But CYBERMAX MICRO is not just about the looks, this jewel packs a lot under the hood, too. High performance stereo encoder with balanced inputs, limiter, precise preemphasis, MPX filter and low pass filter feeds the PLL-controlled FM modulator. There's place for optional RDS daughter-board inside as well. Covers the entire band from 87.5 to 108 MHz. Designed for 24/7/365 operation. Really handy for experimenting, MPX input can be added easily. Ideal for guided tours, realtor-type advertising (just add any Mp3 player), indoor use for re-broadcasting internet radio stations or a small community radio station. If you need to connect XLR connector, email for instructions. DOES NOT use the ill-famed Rohm chip. Tiny in size, big in features, performance and looks, Cyber Max Micro! HOT TIP: Save 5-10% off product price by promoting our website. Here's how. To purchase accesories for this transmitter look under antennas or accesories on this page! NEW PROFESSIONAL SERIES OF FM TRANSMITTERS, STEREO AND WIDEBAND! 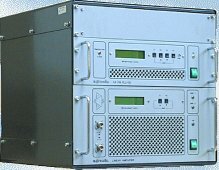 CYBER MAX FM 15W is the first from a line of rack mounted FM transmitter series for demanding broadcasters, operating in the whole band II, from 87.5 to 108 MHz. Transmitter consists of the SE3+ stereo encoder with pre-emphasis circuit, active low-pass filter, stereo encoder, synthesizer, the wideband no-tune power amplifier and an optional mains power supply. Unit is boxed in a professionally looking 19" rack mount enclosure. It even has SWR and TEMP protection circuit. It is rugged and made for 24/7/365 operation. Each unit has a wide-angle high contrast backlit LCD display. Probably the best value for your money. 15W version outputs up to 20W of RF power. Have a preview - quick look at the manual! To purchase accesories for this transmitter using scroll to the bottom of this page! We bring you the new 100W STEREO FM transmitter with balanced audio inputs and DSP stereo encoder. Frequency and power adjustment is via LCD menu system. Great performance and suitable for more powerfull local stations! Have a quick look at the manual (same as 150W version, but 100W)! We bring you the new 15W STEREO FM transmitter with balanced audio inputs and DSP stereo encoder. Frequency and power adjustment are all done via the LCD menu system. Great performance and suitable for more demanding broadcasters! Large 2H 19" rack enclosure offers plenty of space for adding a 150W or 300W amplifier later, with provided space for mains power supply and two cooling fans. Have a quick look at the manual (same as 150W version, but 15W power)! Temperature protection and SWR protection! We bring you the new 40W STEREO FM transmitter with balanced audio inputs and DSP stereo encoder. Frequency and power adjustment are done via the LCD menu system.Great performance and suitable for more demanding broadcasters! Have a quick look at the manual (same as 150W version, but 40W)! We bring you the new 150W STEREO FM transmitter with balanced audio inputs and DSP stereo encoder. Frequency and power adjustment are done via the LCD menu system. Great performance and suitable for more demanding broadcasters! We bring you the new 300W STEREO FM transmitter with balanced audio inputs and DSP stereo encoder. Frequency and power adjustment are done via the LCD menu system. Great performance and suitable for more demanding broadcasters! Have a quick look at the manual (same as 150W version, but 300W power)! These units below are suitable for community radio stations and professional installations where funding is not a problem. These units are all certified and come with excellent documentation. We bring you the new line of professional certified FM transmitters from an internationally established manufacturer. PROFESSIONAL 500W COMPLETE FM TRANSMITTER! This unit is a rack package/combination of a 30W exciter and 500W amplifier. 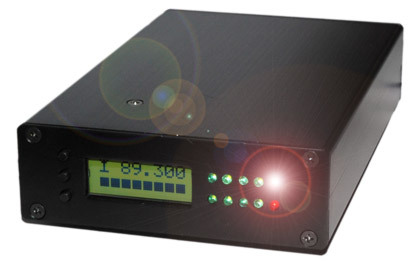 PROFESSIONAL 1000W COMPLETE FM TRANSMITTER! This unit is a rack package/combination of a 30W exciter and 1000W amplifier. PROFESSIONAL 1500W COMPLETE FM TRANSMITTER! This unit is a rack package/combination of a 30W exciter and 1500W amplifier. PROFESSIONAL 2000W COMPLETE FM TRANSMITTER! This unit is a rack package/combination of a 30W exciter, two 1000W amplifiers and a combiner. PROFESSIONAL 3000W COMPLETE FM TRANSMITTER! This unit is a rack package/combination of a 250W exciter with touch display, one line control amplifier, one control amplifier and two 1500W FM amplifiers plus a combiner. RF Output connector: EIA 7/8"
PROFESSIONAL 6000W COMPLETE FM TRANSMITTER! This unit is a rack package/combination of a 250W exciter with touch display, one power control unit, amplifier control unit and four 1500W FM amplifiers plus a combiner. RF Output connector: 1+5/8" - 7/8"
PROFESSIONAL 10000W COMPLETE FM TRANSMITTER! 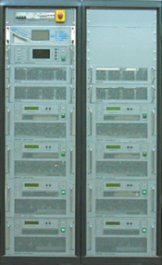 This unit is a rack package/combination of a 250W exciter with touch display, one line control amplifier, one control amplifier, two dummy loads for testing and eight 1500W FM amplifiers plus a combiner.